Drag one or more applications or files you'd like to launch into the box. Connect to a hotkey or keyword to launch them! How do I use this action? Add the Launch Apps & Files action and drag in the applications or files you want to open. The easiest way to do this is to search for the application or file in Alfred and drag it directly from Alfred's results into the action box. You can then connect the action to a keyword or hotkey to quickly launch it. In the screenshot at the top of this page, you'll see we connected each action to their respective hotkey, but you could drag multiple files or apps into a single box to launch multiple apps or files with a single hotkey. 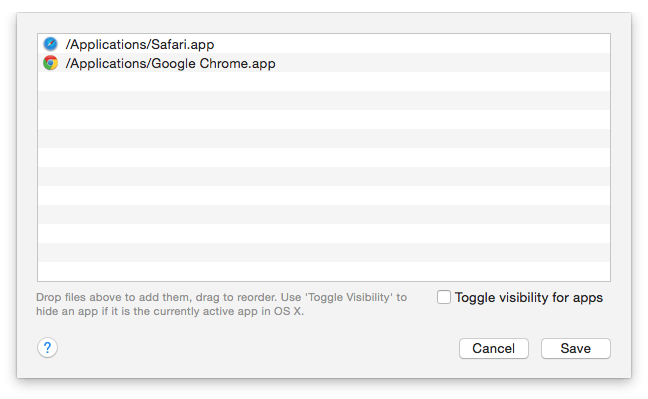 Optionally, check the "Toggle visibility for apps" to tell Alfred to toggle the visibility of the apps & files if they're already in front focus for a quick way to hide an app.